I love to be blown away by a book!! I love that rare ocassion when you randomly pick up a book and hope it will at least hold your interest just until something else comes along, to listen half-heartedly, then--be drawn in thoroughly, completely--to the point where you forget everything around you and become so engrossed in the story that the house could be burning down around you and you wouldn't notice till your toes got hot! 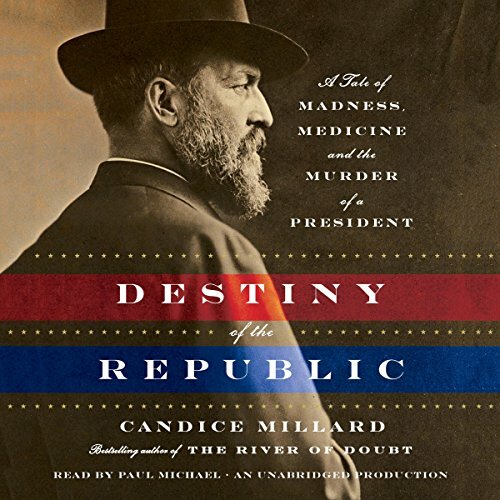 In the case of Destiny of the Republic, it isn't the history of 20th president James Garfield alone that catapults this book into the category of toe-toasting "amazing"...it is the meticulous research and straightforward writing of former National Geographic writer and editor, Candice Millard--a truly great historian/author (and we could probably add detective). A book about Garfield would never have been tops on my Wish List, but I'd read Millard's first book, River of Doubt, (about Theodore Roosevelt's trip on the Amazon) and found it fascinating. Based on that read, I figured I had a winner. Now I have to say, Destiny of the Republic is even better, and I have a new picture of Garfield and wonder what might have been. The book establishes the dignified character of Garfield, the high esteem the people had for him, his erudition, and his humanity. It goes into detail about the schizo plottings of the crazed assassin, Guiteau (and some fascinating history of the "insanity plea"). But, it focuses largely on the 79 day period while Garfield, Guiteau's led bullet lodged somewhere deep in his back, suffered at the hands of the woefully arrogant Dr. D. Willard Bliss, and the dedicated Alexander Graham Bell's fervent race against time to perfect his "induction balance machine" in hopes of locating the bullet and saving Garfield from Dr. Bliss, and therefore, Garfield's life. The details of the dreadful and ridiculously archaic treatments Garfield suffered through at the hands of the ignorant Bliss, and the account of the autopsy, are painful to read about and shed light on the great progress medicine has made. At his trial for the murder of Garfield, Guiteau nonchalantly admitted to shooting Garfield, but insisted that he did not kill Garfield, rather it was "malpractice killed Garfield." A slower first half, but you'll be rewarded with a mesmerizing tale, some fascinating medical history and facts, all wonderfully narrated by Paul Michael. *If Candice Millard wrote the history books for school--the students would never miss a day. Fantastic read I highly recommend to history buffs and non-history buffs alike. One of my all time favorite nonfiction books! I was first introduced to Mr. Garfield through a song recorded by Johnny Cash entitled, "Mister Garfield." As it turns out, the song is even greater after I read this book. This book is very well written and moves quickly. The author provides clear but only necessary details. You will not get bored with this book. There is plenty to offer for people with a wide variety of interests. First, you are offered a patriotic recount of the history of this president along with the political landscape of the later 19th century. If murder, insanity, and crime peaks your interest, there is plenty of that. Maybe you're interested in medicine, sickness, surgery, and suffering...it's all here. Or, if you're like me and have an interest in technology, you will not be disappointed. Alexander Bell plays a large roll in this book. I think the reader is excellent and did a great performance. The only downfall to this book is the lack of actual presidential duties and orders Mr. Garfield certainly had to make while he was "recovering." There isn't so much of a hint as to anything he actually did regarding policy after he was shot. Overall I gave this book five stars. Highly recommended. I thought it would be good. I thought I'd learn a little about history and maybe know more about a President forgotten by time. This was SO much more than that. At once a wonderful character study of a man who never wanted to be President, who hated campaigning for office, who conquered every subject matter he encountered and who was on the verge of fighting for noble causes in the White House and the study of the man who shot him twice (but didn't kill him), who had lost all touch with reality and who had every opportunity to turn his life around. It would have been great had it just been the story of these two men and how their lives somehow collided. But it is also a picture of the people surrounding the White House, those struggling for power, those (like Garfield's Vice President) who wanted LESS power and the story of two men you have heard of, but never knew as more than caricatures of history (Alexander Graham Bell and Dr. Lister, and how they were so much more than our history books tell us). This is also the story of what happens when a nation generates and ignores certain scientific discoveries. Had the doctors who cared for Garfield understood the medical procedures used for the previous 15 years in Europe, then Garfield would have lived. His doctors killed him, and the deterioration of his condition is so painful you will cringe in your seat. At the same time, we watch Bell invent something you had no idea he was involved with, and how his work AFTER inventing the telephone saved countless lives. This is a marvelous book, exciting, adventurous and educational. I loved every minute of it. Buy it now. You will not regret it. Great book with interesting details. Here's a president people generally don't know much about and his assassin, who most people know nothing about. I really feel like I learned so much about James Garfield, Charles J. Guiteau, and Alexander Graham Bell. Not only do you hear about the details of the events leading up to Guiteau shooting Garfield, but you get a clear vision of the motivations of Guiteau, Bell and Garfield. The descent of Garfield's health after the shooting, due to gross mistakes by Garfield's doctors, continues to amplify sympathy for Garfield. If you find a book well narrarated so much more enjoyable, this is a huge plus for this audio book. Paul Michael can consistently narrate the characters, with accents, different pitches and even women's dialogues. If you love history, especially presidential history, I highly recommend this book. This was a fascinating book on a subject I had no idea I was interested in. I probably wouldn't have bought it if Audible hadn't offered a free chapter, but it grabbed me right away and the pace never let up after I bought the entire audiobook. I love history, but this one sounded a little dry, to be honest. Many enjoyable hours later, I was thrilled to be proven wrong. "Destiny of the Republic" covers a part of both presidential and medical history that is rarely told, and never in a single book written in such a compelling, accessible style. The author weaves a number of apparently unrelated storylines together seamlessly, much like "Devil in the White City," and with equally thrilling results. The narrator was perfect --- credible, erudite and believable but never "teachy" or stiff --- and that rare combination of engaging narrator and fascinating, well-researched historical tale made this one of my favorite listens of 2011. And I'm saying that about a book that would have never even made my Wish List initially. So if you read the book's description and think it sounds fascinating, go for it --- you'll probably love this book. If, like me, you aren't intrigued by the subject matter at first but enjoy being pleasantly surprised, just try the first chapter. I'm guessing you'll love it too. Highly recommended, in either case. I bought this audiobook based on a 'recommendation' email from audible.com and thoroughly enjoyed it. I learned so much about James Garfield and the state of science at that time. I believe the author does a great job of describing the inner workings of the devices of Alexander Graham Bell without drowning you in detail. I am left wondering how the course of our country may have been different had 'germ theory' been more widely accepted at that time. The assassin was menatlly ill and hearing how he went through life was enlightening. I do not remember learning very much about this part of our history while in school. The narrator, Paul Michael, does a great job with the material. I will certainly be listening to this audiobook again. To a fan of presidential history, this book concisely and compellingly highlights the character, wit, and courage of an often overlooked president. Would the Guilded Age have progressed differently had Garfield survived? We'll never know but this book tells the story a much beloved president. As a history buff I'm especially grateful for a story that illustrates a critical ripple in the fate of the nation. In the case of Garfield's assassination, it was certainly for ill. He was a great American; citizen, teacher, general, congressman, and even president in the too brief time he presided. Much obliged for the great read. This very enjoyable book gives an interesting perspective on the contrast between the wealth of scientific progress and discovery occurring at the time of President Garfield's assassination and the ignorance used in treating his wounds. It involves the contrasts between the environment of corruption and egotism of some of the actors in the drama with the nobility and unselfishness of others. Further the book acquaints us with the promise of the man who was James Garfield, a president about whom few of us have any knowledge. The narrator does multiple voices and accents as well as I have heard them done in audiobook format for a work of non-fiction and makes the book as exciting as any work of fiction, although one knows from the start the end of the story. I recommend it highly for its unusual approach to an important moment in our nation's history from multiple perspectives. What a fun way to learn some history! I love finding books about history that are really well written, and tell an intriguing story. This was definitely one of those books. The author did an amazing job of researching this story to find all the little details that made this book so interesting. When I bought it I expected it to be a history of James Garfield's life, but it told a lot more than just about his life. I really enjoyed learning about the crazy life and delusions of Garfield's eventual assassin. The guy was nuts, and yet I don't believe he was insane. Elements of his life reminded me of people I know today - scary!. The other minor story within the bigger story was about the doctor who attended Garfield after he was shot. He used extreme confidence, and a bold personality to become the primary doctor to Garfield without ever being assigned the role. He just pushed his way into the action immediately following the assassination, acted like he was in charge, and then pushed all the other doctors away; all without ever being given permission to do so. There were so many fascinating elements to this story that almost anyone would enjoy listening to it, but if you love history and want to learn about it, this book is a must "read". The author did well in capturing my attention from the beginning chapter. Millard did a superb job of intertwining the social, scientific and political worlds at the time of the presidential shooting. Being unschooled about the particulars of the Garfield assassination, it was an intriguing read to learn about the shooter, the doctors and the politics of science. Perhaps the most interesting parts of the book lay in the details about Garfield's academic life and the role his family played, especially the role of his wife, in many of his political decisions. Most importantly, Millard explained in great detail the arrogance of physicians and how their limited knowledge accelerated the death of the president. We are also introduced to the black physician who initially assisted the wounded president. A great read sewn-together nicely. Narration was superb and easy to listen to.